MSNBC host Joy Reid used her program to attack House Majority Whip Steve Scalise while he recovers in the hospital following being shot by a left-wing gunman. Instead of using the tragic incident to lower the temperature between left and right, Reid threw gasoline on the rising political tensions. Reid and guest NAACP Reverend William Barber II, President of the North Carolina NAACP branch, took turns slamming Scalise on a range of issues including race. Louisiana Rep. Steve Scalise is still hospitalized and in serious condition but liberal MSNBC host Joy Ann Reid didn’t let that stop her from portraying Scalise as an extremist just three days after an angry left-winger shot Scalise and tried to assassinate dozens of Republican congressmen in Alexandria, Virginia on Wednesday. Reid had NAACP board member Rev. William J. Barber II — a prominent liberal who spoke at at the Democratic National Convention last July — on her show Saturday morning and the two quickly set about attacking Scalise, who is physically unable to defend his record. Newsbusters highlighted Barber’s comments that Republicans stop taking advantage of minorities. The Reverend Barber declared that he hopes that Scalise stops being “homophobic,” and that Republicans — presumably including Scalise — stop “preying” on “the poor and on minorities and the sick,” and at one point even quoted from the Bible a passage that seemed to suggest that Scalise suffered “woe” because of his legislative actions. Outrageously, Reid is exploiting the recent tragic event to make political points against Republicans. 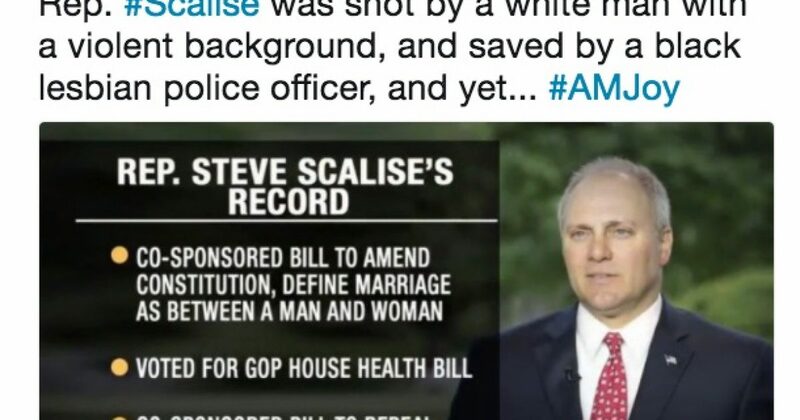 Attacking the policy positions of Scalise and Republicans feeds into the left-wing narrative that Republicans are evil and need to be stopped by any means necessary.